Join Us every 3rd Tuesday of the month, April through October, for our Emerald Coast Fishing Seminars! 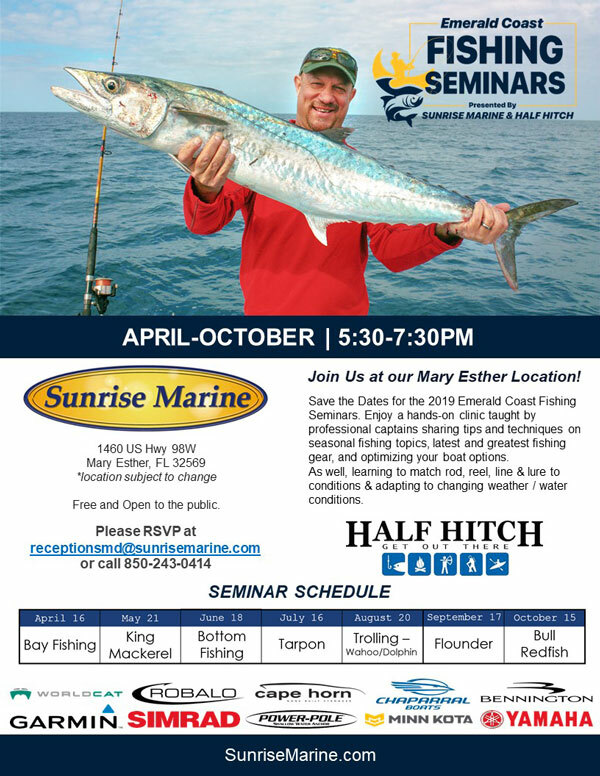 Sunrise Marine and Half Hitch Navarre are proud to present this awesome series of seminars at our Sunrise Marine Mary Esther location. Enjoy a hands-on clinic taught by professional captains sharing tips and techniques on seasonal fishing topics, latest and greatest fishing gear, and optimizing your boat options. As well, learning to match rod, reel, line and lure to conditions and adapting to changing weather/water conditions.